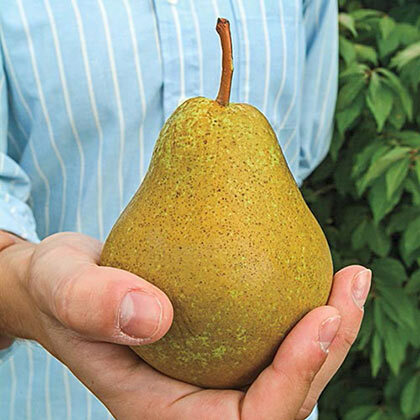 Ambrosia Pear Tree | Gurney's Seed & Nursery Co.
Big Fruits with Spectacular Flavor! Exquisitely rich and juicy with a smooth texture—you'll delight in Ambrosia's unparalleled flavor! This very high-quality pear bears annually and at a young age (often in its third year), with high tolerance to fire blight. Huge, golden-brown fruit, often blushed with soft pink, is ready for harvest in mid to late Aug. PP16759. FruitGolden-brown, russet fruit with pink cheek. Rich flavor with a buttery, grit-free texture when properly ripened. Soil RequirementsWell-drained, fertile loam soil. CommentsExtremely high quality pear reliably produces annual yields. Huge smooth-textured golden fruit (non-gritty), often blushed with soft pink, is exquisitely rich and juicy. Ready for harvest in mid to late August. High quality pear bears at a young age. High tolerance to fire blight. 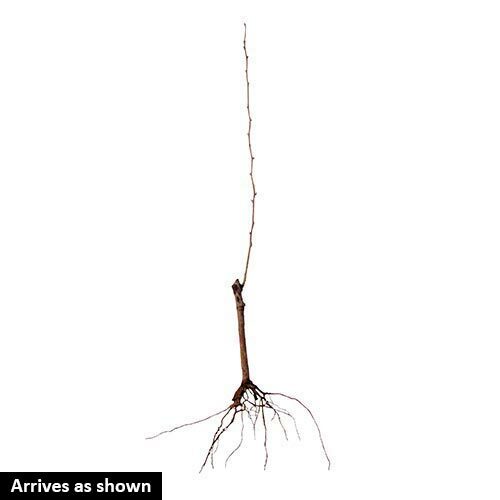 DepthLocate the planting depth indicator, the marked line above the tree's root system. The graft should be about 2 inches above the soil surface.